Ubud Dedari Villas are located on the path of the “Ancient Trek” described by Richard Mann in his book “Bali’s First People : The Untold Story”. You can find us right next to Dedari Temple. Goa Gajah is well known to tens of thousands of tourist intrigued by the 1000-years-old cave and fascinated by the Hindu and Buddhist history of the complex, but only a few take time to explore beyond the cave and its associated purifying Holy Springs to stroll down close to the Petanu River which glides by not too far below. Now the local Gianyar Government has made it easy by building steps and a walkway which lead to a gentle but exciting Ancient Trek adventure along the steep, wooded, banks of the river where giant trees and roots fascinate as much as the history. 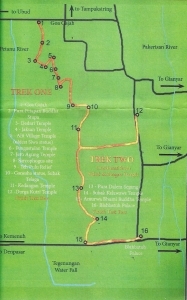 The path is dotted with ancient shrines and soon arrives at the quiet village of Bedulu, seat of Bali’s last pre-Majapahit king and where there is still a small palace and an important temple. A prehistoric sarcophagus has even been found in this venerable place. You can see it at the home of a villager. At the nearby 14th century rock sculpture at Yeh Pulu the death of Bali’s last pre-Majapahit king is commemorated with a statue. From holy cave, to river-bank shrines, through ancient Bedulu to Yeh Pulu the Ancient Trek winds its way through wet rice fields peppered with historic temples and shrines filled with ancient Hindu and Buddhist sanctuary, some among the oldest in Bali. 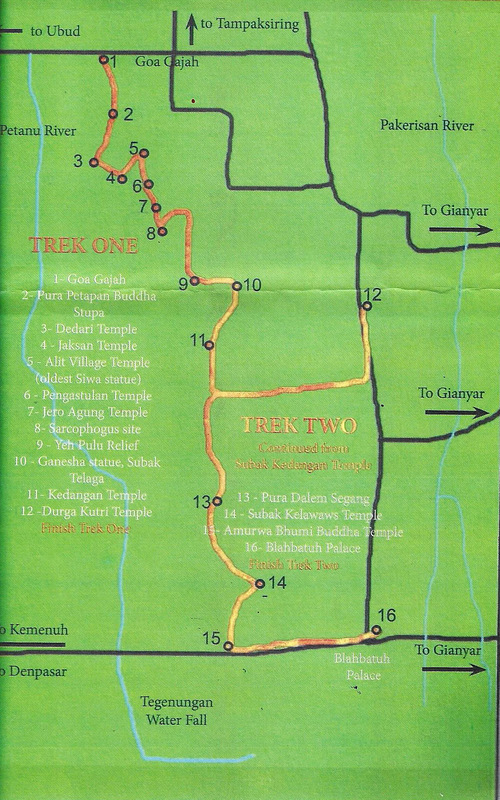 There are two trekking routes : the first and the shorter one ending at Durga Kutri Temple and the longer one ending at Blahbatuh Palace. 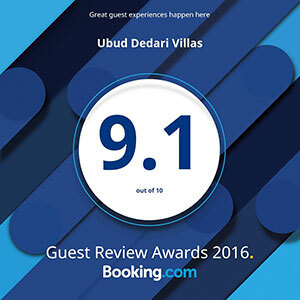 "The little jewel in Ubud's crown"
"Great accommodation nearby Ubud (villa)"